● FilterEasy has been known to offer special incentives to new email newsletter subscribers, such as a $5 discount on your next order. ● FilterEasy offers free shipping and returns throughout the continental US. Refunds must be requested within 30 days. ● The site also offers toll-free hotlines for order inquiries or product questions. FilterEasy endeavors to be the company you can trust for the best HVAC filters to be found anywhere. To that end, they offer a range of filters that can allow you to breathe clean, perfect air. The Allergen Series is particularly worth paying attention to. There is LiteAllergen, MicroAllergen, and SuperAllergen. 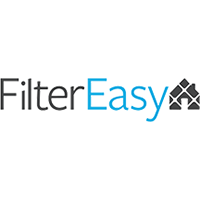 The most popular filter offered through FilterEasy is the MicroAllergen filter, but the range of products is still such that no matter what you are looking for in the way of a powerful filter for your HVAC, you can find something. The website also offers visitors the opportunity to sign up for their mailing list, which will keep you up to date. For most up to date offers check out Filtereasy on Facebook and Twitter or contact Filtereasy Support for any questions.